As part of our routine health check, we will examine your pet’s mouth. Thorough and regular cleaning of your pet’s teeth removes plaque bacteria before it can accumulate and cause inflammation and damage to gums and teeth. Plaque can also turn into a very hard substance called tartar. 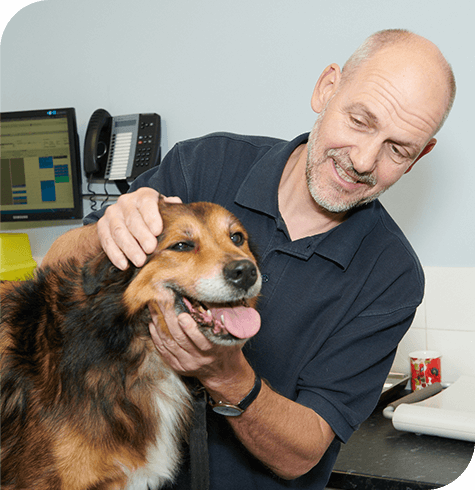 For any dental procedures, your pet will be admitted for the day and the procedure will involve a general anaesthetic. The vet will examine your pet’s mouth, tartar will be removed, and any unhealthy teeth may need to be extracted, the teeth are then scaled and polished. We recommend getting into good dental habits when your pet is at a young age. There are lots of effective products available and our trained vets and nurses have plenty of tips to offer too. Brush your pet’s teeth with a special pet toothpaste to remove plaque before it turns into tartar; aim to do this twice a week but ideally every day. An enzyme paste or gel can be used to help prevent plaque build-up; this is easier to use than toothpaste and just getting it into the mouth will help. Feeding your pet a specialised dental diet will help reduce tartar build up. These diets have been formulated as a dry biscuit with a large kibble and different consistency. The fibres scrape and rasp the plaque off the teeth without damaging the enamel. Using a mouthwash will help kill bacteria and freshen breath. You can add this to your pet’s drinking water or put straight into the mouth. Products such as ‘Plaque Off’ can be added to food daily. They work through the blood stream affecting the plaques ability to stick to surfaces in the mouth and soften tartar. Encourage your dog to chew raw-hide or dental toys/chews, these can prevent plaque and tartar build-up. We recommend you book a routine scale and polish under anaesthetic every 12 months or at the first sign of tartar build-up.